We are almost at the end of summer and I can’t believe how I haven’t shared this Tangy Tomato and Corn Salsa yet. This salsa is one of the best summer recipes and we make it a few times in a week. We love to have this salsa in two ways. We sometimes have it with nachos as a dip, especially when we are having a movie night. We sometimes have it as a side dish, a very appetizing one, isn’t it? 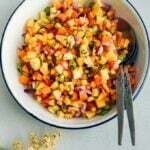 This vibrant salsa can make even the picky eaters enjoy what they have on their plate without questioning. 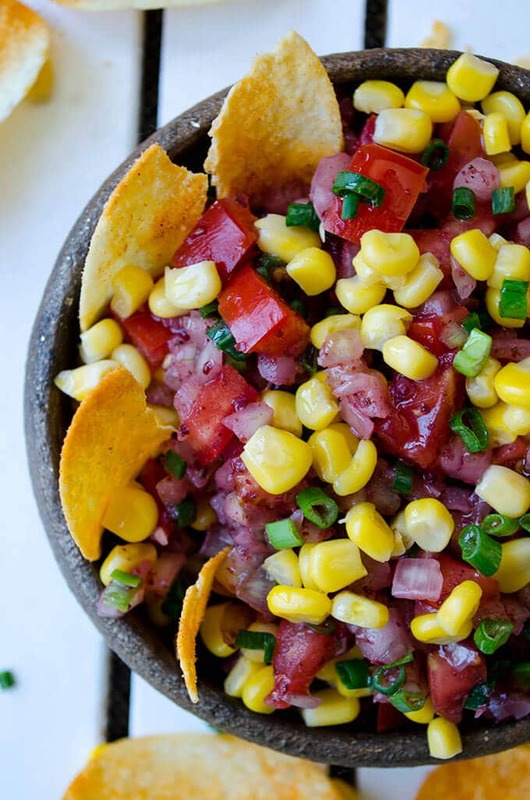 This is a tangy corn salsa with tomatoes and onions without any lemon juice. I used a good amount of sumac just like in our traditional Ezme Salad, which is a spicy juicy tomato salsa served with kebabs. This lovely spice is such a great source of tanginess that you don’t need any lemon juice. Hope you can find this Middle Eastern spice in your area. An important note on it: Taste it before you buy unless it’s packaged. It may not have the desired taste because not all sumac types are at the same level of tanginess. Their color might differ as well. If it is pinkish, you can buy it without thinking twice as it means it is really fresh. It gets brownish as it waits. Most salsa recipes around the web calls for red onion, but I used white in this tomato and corn salsa because I wanted to give it a lovely pink color with sumac. Rub finely chopped onion with sumac well to give them a nice pinky color and let them absorb the tangy flavor of sumac. I really want you to taste the tomato corn salsa with sumac because it has a unique taste, but if you can’t find it in your area, you can still make this recipe. Just use pomegranate molasses to give your salsa a similar uniqeness. Lemon should be your last choice for this salsa since you will end up with something you are already familiar with. Sometimes we should be after new tastes and new combination of flavors, right? Salsa with tomato and corn flavored with sumac. Combine sweet corn, chopped tomatoes and green onions in a bowl. In a separate bowl or on a cutting board, rub the chopped onion with sumac and salt until they get pinky and transfer them into the bowl. Mix well until everything is wonderfully combined. Drizzle olive oil over it and serve with nachos.